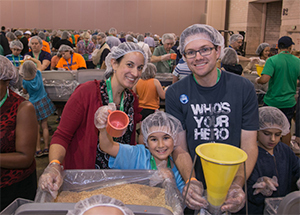 But almost 3,000 people experienced a connection with Burkina Faso by packaging 255,848 meals at September’s World Meeting of Families in Philadelphia. As part of Catholic Relief Services Helping Hands, people from all over the world gathered over 3 days in hour-long shifts to feed a nation where an ongoing drought has created a hunger emergency for orphans, widows and people living in poverty. Held every 3 years, the World Meeting of Families is the world’s largest Catholic gathering of families. 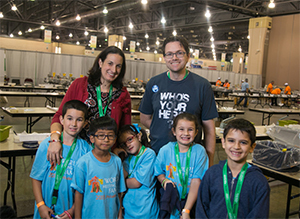 Richard and Angelique Lopez made the trip from Miami, Florida, to Pennsylvania with their five children. They thought the Helping Hands event would be a time for their children to experience spiritual growth. The Lopez family enjoyed packaging the meals, which contain a special mixture of fortified food for Burkina Faso. Their children asked if they could do it again soon. Helping Hands is a partnership between CRS and Stop Hunger Now to eradicate world hunger. Meal-packaging events like the one at the World Meeting of Families provide more than just a nutritious meal. They help CRS change lives. For over 75 years, CRS has worked in Burkina Faso, developing extensive programs that not only feed hungry people, but provide resources and training to help them rise from poverty and escape hunger for good. For those who volunteer to package the meals, the feeling is like no other, and is probably summed up best by 9-year-old Emmanuel Lopez. “To help people is nice,” he says. Find out more about Helping Hands and get involved.